OK so how’s this for awesome: Applegate, maker of high-quality natural and organic meats is offering Dinner: A Love Story readers an exclusive giveaway. And it’s not just because they got wind of the fact that my 10-year-old sausage lover and my 11-year-old roast turkey sandwich addict have, I’m pretty sure, kept them in business for the past decade. Turns out they’ve been doing a little family dinner research that you guys might not find too surprising — 89% of parents they surveyed felt it was important to share a meal together, but nearly half of those same parents cited lack of time, inspiration, and picky eating as major snags. Hence: their Take Back Meal Time mission, and hence a full-on Pizza Making Kit giveaway that dovetails nicely with my mission, aka There is No Dinner Dilemma That Can’t Be Solved By Pizza. The pizza kit includes Appletgate Mini Turkey Pepperoni, Applegate Provolone Cheese, a jar of Jersey-fresh tomato sauce, King Arthur Flour Pizza Crust Mix, a wood-handled pizza cutter, an illustrated pizza tea towel, and a sweet little recipe and information booklet that tells you all you need to know. Not bad, right? One commenter will be chosen at random and must live in the US. Contest ends on Tuesday, January 28 at 8pm ET. Good luck! Toppings: tomatoes, red onions, peppers, mushrooms, black olives, basil, artichokes and turkey pepperoni. I am totally feeling the turkey pepperoni. Update: The winner is Anne (#386). Thank you to everyone who participated! DALS has revolutionalized our family dinners! We cook from the blog or cookbook 4 times a week with our 2 year old and 4 year old. Thank you!!! This is awesome! We are homemade pizza addicts in our house! We’ve been making pizza every Friday night with your crust recipe in your book! Some of the best ones were with random ingredients found in our fridge! I Absolutley love pizzas because they are relatively cheap and easy and feed a family of two for days. However, I’ve been stuck in a just veggie and cheese rut! This would be the perfect kit to break me out of it. Thanks for the chance to win! I don’t have any kids yet, but my partner and I constantly check the blog for great dinner ideas (and Andy’s drink suggestions!) Thank you for some amazing dinner memories! Pizza night is a Friday night ritual in this household! Homemade pizza is critical to surviving the week for me; either I am freezing it for lunches or a last min Friday night meal. Would love to win this giveaway! We love pizza night. I see a Friday night pizza in my future! Love pepperoni and really need to switch to a healthier version. I’m going to have to try it. I WANT THAT PIZZA KIT!!!! Ehem. Thanks. Hooray! We do family night every week with a movie and pizza. Would love to try their kit! OMG! I would love this! We have pizza night every Friday, I don’t eat pork, but I soooo want to try that turkey pepperoni! My 2 year old loves pizza! Would love to win this! I have been stalling on learning how to make homemade pizza – this might help. This is great, we just started making our own pizza dough. Sweet! I absolutely love pizza. And I love your blog. Delicious! Would love to give this a try! Monday night is pizza night here, this looks like a new option! Friday night is pizza night. Maybe we should do homemade this week! Such a fun prize!!! Would love to try this out with the kids. Fingers crossed! Thanks for the giveaway! Love make-your-own-pizza night… 🙂 Thanks for the constant stream of ideas and inspiration. Pizza is our go-to, as well. The kids love to “paint” their pizza (apply the sauce with a basting brush). My mom always insisted as we were growing up that we do family dinner because “kids whose families don’t eat dinner together do drugs.” To this day, my brother and I make fun of her, but it’s one of the only activities we insist on when we come home from college! We’re big into pizza night at my house and I’d love to try the Applegate turkey pepperoni and cheese! Applegate and King Arthur–what a great pairing! Pizza sounds great right now (-45 degree windchill)! Love this idea! I just got a pizza peel and this would be great to break it in! I’d love to make pizza with this kit! I love pepperoni, but a lot of brands have nitrates and artificial junk in their meat. The turkey pepperoni sounds good! A wood handled pizza cutter would be a big step up from my kitchen shears! Pizza is one of the few things that pleases the whole family, and we would love to try the turkey sausage! great idea! love applegate – and pizza! i love making the DALs pizza! but i’d take a crack at this, too! pick me! 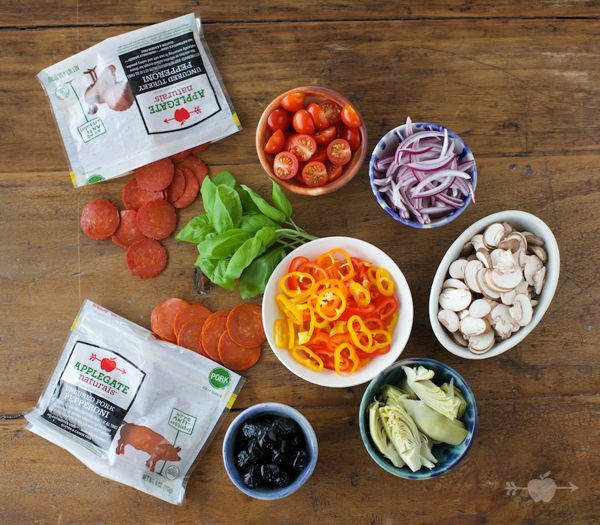 Love this and especially interested in trying turkey pepperoni. I love making pizza at home, but I’ve yet to transition to making my own dough. Maybe that will be my next goal! Yum! Pizza is a big hit in our house, even without the cheese, if you can believe it! I changed my work schedule to eat dinner with my kids. Pick me!! We love DALS, we love homemade pizza, and we love Applegate! This is a win-win-win! That would be so great and yummy in my house. Homemade pizza is just the cure for the Polar Vortex! Would love this – pizza is usually a weekend lunch at our house..
Yum! Love making personal pizzas for dinner. This would be an awesome prize!! Yum! Love making personal pizzas for dinner, great idea! Ironically, I just made your pizza dough from Time for Dinner the other night…it was fantastic! Pizza! The one food everyone in our house can agree upon! This is awesome! I love Applegate and your blog has made me a total believer in homemade pizza! I love a good homemade pizza! This is a great giveaway. We love pizza! I could eat it every day, I think. And homemade pizza tops (no pun intended) any other kind, hands down. Ah, pizza night! A life saver at our house, too! We also keep them in business- love their breakfast sausages! What a great giveaway. We love Applegate products around here–they make the best hot dogs! Can’t wait to try the pepperoni. Pizza does make everything better! Nothing says family like a pizza and movie night. Yum! We love Applegate — always have their deli roasted turkey and maple breakfast sausage in the fridge/freezer! I love pizza and agree that it can solve all sorts of problems! omigosh — Applegate is making turkey pepperoni???? I hope it makes it way to the West Coast!! I seriously am a big fan of their products!! We’re all about DIY pizza in our house, what a fun fun giveaway! This is great! I love doing homemade pizza nights with the family, such a fun thing to do! Applegate is my favorite – pick me! I’m in love with Applegate hot dogs. Unfortunately, my kids are weird and don’t like hot dogs–but they do love pizza! Great giveaway! Thanks. We love homemade pizza night, and for the one kid in the family who doesn’t, we make a calzone instead. This is fabulous! Can’t beat a wholesome, delicious family pizza night. who doesn’t love “make your own pizza” night? great giveaway! We made homemade pizza last week and used Don Pepino sauce like you suggested. It was delicious! Yum! My husband is the pizza maker in this house. I’ve never heard of Applegate, but I’m a fan already! Friday night is pizza night! Homemade as often as we can make it happen. I love homemade pizza. Fingers crossed! Our weekly homemade pizza night is an institution in our house. I have to check out that turkey pepperoni! 3 teenage girls at my house love pizza! Thanks! I love Applegate products and would love to try the pizza kit!! We love homemade pizza at our house. . I have a teenage girl with LOTS of friends who eat over that make it a necessity! Thanks! This looks like a perfect pizza-making kit! And I agree–there is no dinner dilemma that cannot be solved with pizza night. I use your blog as a jumping off point and inspiration for those times when I’m stumped as to what to make for dinner. That means about 4 days a week I’m pulling from your site. And yes, we love our homemade pizzas! Count me in. What a clever little kit idea! Yay! I made kolaches this weekend with their chicken and maple breakfast sausages. My 4 -year old took one in her lunchbox today. Love their products. My kids BEG me to make pizza for dinner! I always hesitate because cleaning up after dough making is such a chore. We are pizza addicts in this house, too. It’s easy, and we can usually agree on toppings everyone will eat. I’d love to win the kit. Thank you so much for the opportunity! Love homemade pizza, always sure to go over great! Homemade pizza is (almost always) a hit with our picky 2 year old! This kit would make dinner really easy! Thanks for the giveaway. Looks great! Now I’m going to have to make pizza for dinner! I’ve been searching for something like this! Great giveaway item. BTW – I saw something on Amazon today that really made my Monday – something coming out August 26, 2014?? My family hearts pizza! Fun giveaway! what a great giveaway. We LOVE pizza in our house. This looks great!! We love homemade pizza in our house. Turkey pepperoni is so much better for you! Turkey pepperoni is awesome! Pizza is a definite favorite among kids and grown ups alike! I love it! Perfect dinner and great way to sneak in those veggies! Your sausage ricotta pizza is on rotation at our house so the pizza kit sounds great. we do Pizza Night most Fridays, its a tradition I adore. My husband loves pepperoni, would love to try out the turkey kind! Such a fun thing to do with guests! Friday night is pizza night at our house! Awesome. This would be a lot of fun to do with our boys! We need to get back into our pizza night! Thanks for the kick in the pants to get going. There is nothing better than to hear your children cheer when you call them to dinner. No easier way to earn the cheer than with a hot pizza! We have homade pizza every Friday night and this would be a dream to win!! Huge fan of applegate. Have a kid with lots of allergies, really appreciate the lack of unnecessary ingredients! We get takeout pizza every Friday. (We used to go out for dinner, before we added two more kidlets to the family!) I keep trying to convince my husband to let me make pizzas (to save money, and to keep him from having to go out to our favorite pizza place, which is 30 minutes roundtrip), but he won’t go for it. Maybe this could help! Thanks for the chance! 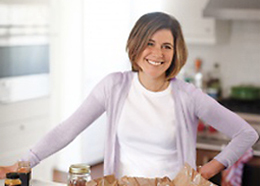 I love Applegate products — they taste wonderful and I feel good giving them to my family. And of course, I love DALS too! What a great partnership! 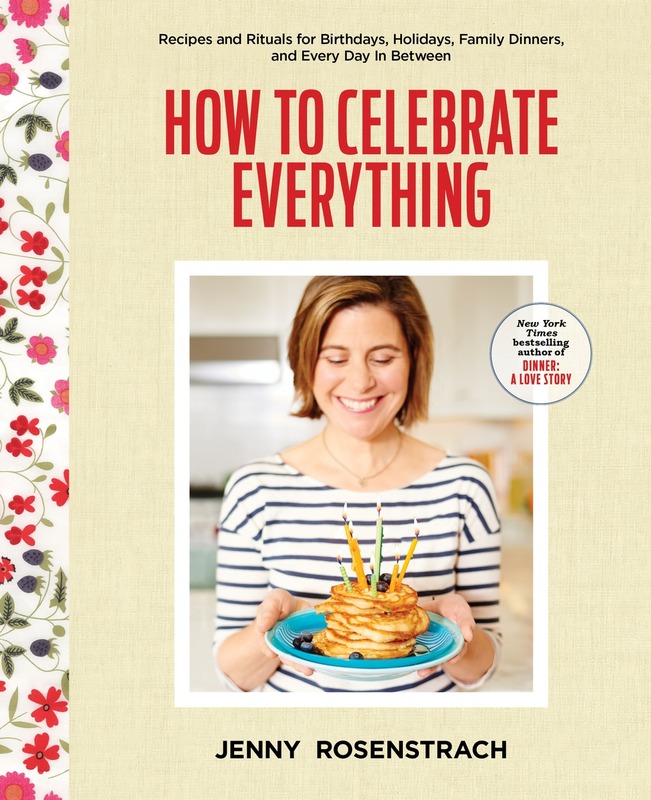 Your cookbook now thumps open to the pizza crust page on my counter! We’re playing the “how much of the 31/2c all-purpose can we exchange for whole wheat & still have a clean pan in the end” game. Wed love to win & give Applegate pepperoni a try! love Applegate, love having a weekly pizza night, love this idea! Love your cookbook and make your own pizza night has saved us many times! Would love to try the Applegate kit. Thanks! My husband is home late every Thursday, and I’ve recently decoded IT IS TIME and we’re doing kid’s cook Thursdays. Wherein I attempt to burn hours to bedtime by teaching my 3 and 6 year old to cook. Pizza is on the menu this week, and let’s be honest, pretty much any other week when I’m not sure what we’re cooking. Thanks for the giveaway! Have never made pizza before, having always lived in large cities where excellent pizza was plentiful. Now that I live in a small Texas town, the only pizza available is big-chain slop. I am going to have to learn to start making my own. Need to shake up the weekly dinner routine, and love the idea of a pizza night! Pizza night is always a winner! Applegate products are excellent, great giveaway! We LOVE making pizza for ourselves. My daughter made a pizza “bus” arranging the cheese as the bus, pepperoni in the windows as the people and olives for bus wheels. Mmm… now I want pizza for dinner! Thanks, Applegate! This would make these frigid Northern Michigan nights something to look forward to! I buy Applegate meats for my always-snacking 5 year old. I am so happy that Applegate is at Target now! Will comment for pizza kit. I would love to win! This looks so fun!! Today is my birthday! I love pizza!! This would be fabulous for our weekly pizza night and my 3-year old loves Applegate pepperoni, to boot! Thanks for the giveaway. This looks great! Our daughter is really getting into helping with dinner, and she would LOVE her own little pizza! We would love this…anything to make a meal night simpler! That looks delicious. Sounds like a plan for our dinner tonight. I love this idea – we struggle every night with this. Pizza is a great solution – this kit would be a huge timesaver. Ah, I was just thinking it was time for another family pizza night! I love your blog and secretly hope I will run into you at Tjoes or elsewhere so that I can thank you! pick me! ; ) Pizza night is the best. This is right up my alley. I’ve been in a dinner-making rut lately! If you’re not feeling that turkey pepperoni, you must be dead. this would be a super-cute housewarming or new parent present, along with a copy of your book, of course! I love it! We mostly eat pizza out, it would be fun to try making at home. Love DALS and would love to get my hands on this pizza kit! Yum! Homemade pizza is the perfect treat for meals at the end of the week, when energy is waning. Love your Book & Blog. I also appreciate Andy’s Longform.org interview. Count me in for the Pizza Prize, please. Would love to win this! Applegate is awesome. I love applegate products – i’ve been a fan for years. And your cookbook and writing keep me coming back for more. Thanks! how fun! i love to make pizza! It wouldn’t be Friday night without pizza at home or at our friends house…this looks like a great giveaway. Thanks for the chance! My 3 year old loves Pizza Night, but we don’t make it at home enought. This looks Yummy! I love DALS and I love homemade pizza. Your crust recipe in the book was a game changer for our pizza nights! Would love to win this kit. I love Applegate and my boyfriend loves homemade pizza! It’s a win-win. If there was one thing I could eat everyday for the rest of my life, it would be cheese smothered pizza. Yet another meal I can make while snowed in here in Michigan. oh please! let it be me! Friday night pizza is tradition and a favorite for my kids! Thanks Applegate and DALS for this amazing giveaway! This is a terrific idea – I would skyrocket from “Mom” to “World’s Best Mom” if I routinely made pizzas for our 5 and 2 year old! what a delightfully delish give away. consider my comment hat thrown. My family loves pizza. Thanks! Now I NEED pizza for dinner. Homemade pizza is on our menu tonight! We cheat in the dough department with premade dough from the store – still fun to make and eat! We make pizza with premade dough- yum! Ah, for the love of pizza. The humble meal that is always a hit. Can be spruced up, or pared down, but will never be turned away. Now this is something that I need to win. No seriously. I have a pizza addict for a husband. I am married to Pizza the Hut (any Spaceballs fans? Anyone?) We have weekly (nay, bi-tri-weekly) pizza nights up in this house. Its tragic. A sweet pizza kit? Now that would be magic. Thanks for another great chance to win a FUN giveaway! This sound perfect for my hungry family! Thank you. I heart DALS! Pizza utterly saves the day during the busy workweeks of two full time parents with one wee toddler who likes to eat everything OTHER than pizza in individuated bits. Great giveaway, crossing my crossables! I would LOVE this giveaway…as would my 10, 9, and 7 year old children. And we love Applegate. Yea!! 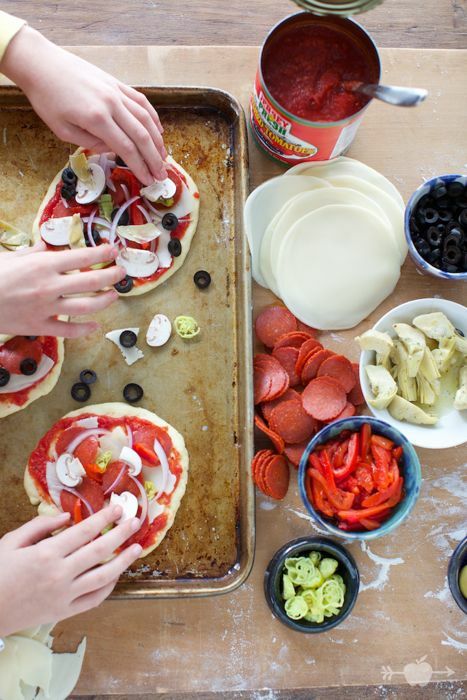 We often have pizza night, this would be perfect for the kids to make it all themselves. eating pizza almost every friday night – we are SO in! Sounds lovely! Sign me up! We love pizza nights in our house. With four boys, it is a great way for everyone to get what they want. I really want to try that Applegate turkey pepperoni – sounds delicious. We LOVE homemade pizza at our house. And it’s been way too long since we had a pizza party! Awesome giveaway! Thanks for the chance. We love Applegate sausage! Pizza is the perfect combo of nutritious, fun, and participatory (?? how’s that for a teacher’s buzzword?). Thank you for the inspiration week after week. We’re loving the no-knead pizza crust recipe from your book, my boys cheer when they realize that’s what’s for dinner 🙂 These toppings look fab – thanks for the giveaway! I would love to win this. I keep failing on homemade pizzas. Maybe this could turn my luck around! Yum! Love homemade pizza. My daughter would eat the Applegate salami for every meal if I let her. I would love to win this – making pizzas at home is one of our favorite family nights! Homemade pizza is a Friday night regular in our house at least once/month. Hubby has perfected his crust recipe but the toppings are always where we get creative. Ooh, I would love to do this as a family dinner with my housemates! This look delicious! We love pizza in our house! Boy, was their analysis accurate–pizza is the best way to get everyone, including three picky eaters (husband, son, me), together and pretty happy eating. Love Applegate. Yum! Turkey pepperoni is my favorite. This would be great, I love making home made pizza at home! yummy! what a fun giveaway. Dare I say it, but I totally forgot about pizza as a necessary part of my meal planning! Thank goodness for this reminder! Love Applegate and pizza. Awesome giveaway! Yes, everyone likes pizza and it’s easy and fun to make with the entire family. We have 5 kids 17 yo down to a 6 yo. The 6 yo recently became part of our family and is adjusting to our (American) food–even she loves pizza. Pepperoni pizza…is there any other kind?!?!? Sounds so good!! I made your skillet pizza last week and it was a huge hit! We love Applegate, and we love pizza, so count us in! I LOVE Applegate. And pizza 🙂 what a fun giveaway! Sounds great! We have been developing our pizza expertise lately! I’m so happy that a professisonal like you has a crappy looking cookie sheet like mine! Need more pizza in my life!! Trapped in the house with two kids with too much polar vortex and not enough time outside! Great giveaway! Making pizzas is always fun for dinner. Thanks for the chance! YUM! Love that tea towel. What a great giveaway! Fingers crossed for homemade pizza! Love Pizza – I want some turkey pepperoni, don’t think we have it here but will look for it. Haven’t yet tried a pizza night, but would love to add this to our arsenal. Said arsenal currently consists of lazy bolognese, pork ragu, and taco night. “Deconstructed” meet “Make your own pizza night”! Winner, Winner! My family has homemade pizza more than I like to admit. But each can be custom to fit our tastes! My girlfriend would love this kit. She’d love that I’m treating her to dinner! Mmm, pizza. It’s been too long again. I love pizza. Love to make it. Love to eat it. Love everything about pizza! Awesome! Homemade pizza is about the only meal we all agree on in this house! Found your blog only about a month ago. Must get your book now. Loving the blog!! Our pizza night is every Fri. I think I enjoy it more than the kids at this point. Love the idea of turkey pepperoni for pizza! I don’t eat beef, pork or “mystery meat,” and oddly enough just discovered chicken and turkey sausage about a year ago. I am completely, hopelessly addicted! I love Applegate Farms (and their chicken sausage, of course!). I’m in thrall to DALS…and pizza, of course! I’ve tried Applegate’s deli meats…delicious. This kit will go well with my attempt to cook more at home. I have been eating their chicken sausage for a few years now. hurray for pizza! thanks for the giveaway! This giveaway is ridiculously fun! I love making pizza!!! I would love to try that pepperoni!!! Yum! Thanks for all you do for us. We rely on your blog! We are big pizza makers here! Pizza happens pretty much every Friday night at our house. Though with our busy schedule during the week, I’m thinking it makes more sense to do it on a weeknight. It’s an easy crowd pleaser! Turkey pepperoni sounds like a winner! I will have to try this soon! We love making our own pizza! Pizza is our favorite meal! Looks yummy! This would be perfect for my pizza loving little man! This is wonderful! It is making me hungry! My daughters (and my husband and I) would love to win this! I can eat pepperoni by the handful. I never quite make it to the pizza part, by I’m trying to change that, because pizza is awesome. We have homemade pizza at least once a week. In Brooklyn it’s just too easy to pick up a pound of dough from the pizzeria around the corner on the way home! My husband won’t forgo the red sauce, but it’s still good with roasted broccoli & caramelized onions. Yum. Pizza Friday would be even better with this kit! pizza is the best Friday night tradition! Totally throwing my hat in on this one. Made the Jim Lahey crust for the first time just last week. Terrific. Homemade pizza has become one of my go-to meals. Would love to try this kit! Pizza rules. This gives new meaning to mother’s little helper! Just made some pizza dough today! Everyone is happy on pizza night. Fridays are homemade pizza and Pinot night…..something for the kids and the tired parents! My kids could live on pizza! Thanks for the giveaway. My kids could live on pizza! Thanks for the giveaway! Yum! My kids would eat pizza every night of the week! Who doesn’t love pizza night? Yum! Yum! looks tasty and fun! Pizza! It’s what’s for dinner…and breakfast!!! Make your own pizza is one of our favorite dinners! I don’t have any kids, but I do have a picky husband who usually eats a sandwich on my pasta/Italian nights. I tried to force feed him your Carbonara though…didn’t work out to well. This would be an awesome compromise! Love, love, love Applegate and we are WAY overdue for a pizza night! Mighty intrigued by the turkey pepperoni. Thanks for the giveaway! Homemade pizza rocks! It’s one of our fav’s on Friday nights. Or Saturday. Or whenever. Would love to try the turkey pepperoni! Thanks for the giveaway! would be fun to have a cooking night with friends making pizza like this! Hi Jenny! Sounds perfect for our weekly pizza movie night 🙂 Thank you for the opportunity! I would not say no to turkey pepperoni. Bring it on! I can eat pizza every day of the week! Make a pizza, toss together a quick salad — and dinner is done. I must have more homemade pizza in my life. I think it’s time to invest in a pizza stone. I had no idea that Applegate makes Pepperoni – I am so excited about this. We’ve been avoiding nitrates and cutting down on preservatives of any kind. Homemade pizza is one of my fav things to make for a group. I just give everyone some dough and free reign on the toppings to create his/her own masterpiece. Easy and tasty! I love applegate bacon and ham, and would love to try the pizza kit! I -love- homemade pizza. It’s so much healthier than the fast food options out there. Pizza is a true problem solver! Pizza nights are the best! This would be such a treat. Love applegate! Great giveaway. Thanks! What a great giveaway! Would love this kit and so would the grandkids! Pizza night is our favorite- my husband makes them on “boys nights’ – when I’m stuck at work late and our sons love it! We loooove pizza! This would be fun to win! 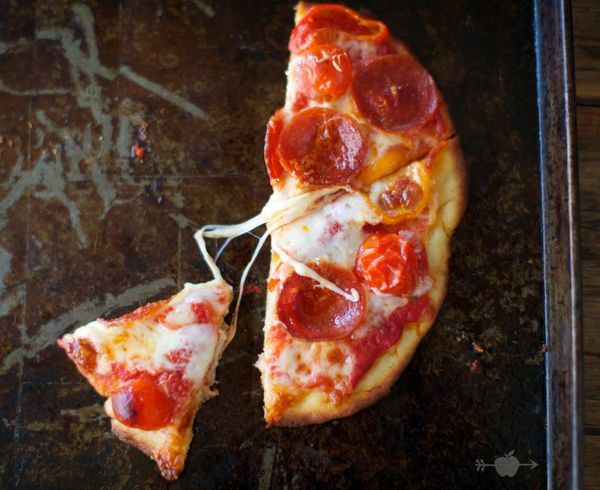 with 4 semi-picky eaters under 11 years old…pizza is our savior! Pizza! The perfect crowd pleaser for a night with no dinner planned. Nice! We just gave our 11-month-old twin boys their first pizza on friday–it was a big hit! Love it and your blog! Thanks for posting this contest, very cool! Nice! We just gave our 11-month-old twin boys their first pizza on friday–it was a big hit! They shared one slice. Pizza night is our favorite! I love making pizza at home! Everyone will eat it and it reminds of Saturday nights growing up! I’m not ashamed to say that pizza is my favorite food! Thanks for the opportunity to contribute to my obsession! This would be so perfect for a grad student trying to eat healthy while writing her thesis simultaneously! Perfect timing for me to stumble across this contest: As I lament the absence of a good pizza cutter in my life, the crust for tonight’s pizza dinner rises on the radiator in my bedroom! Our house is always ready for homemade pizza! We always use your crust recipe, it is the best! My family of 6 hosts regular family pizza parties with friends! A new favorite: Lidia Bastianich’s potato pizza crust. Delicious. Would love to win this package. Build-your-own pizza is fun and a great way to make everyone at the dinner table happy. We definitely help you keep Applegate in business:) have never seen the turkey pepperoni though. Excited about trying it! my son is constantly asking for pizza, but haven’t yet found a crust i love without making my own. hope to try this one. This sounds great! We used to make pizza a lot on the weekends, but we stopped for some reason. It’d be great to start making pizza again instead of ordering delivery! What a cool giveaway. We love pizza nights! My toddler would love to help make pizza! Every Friday is pizza/movie in our house–sometimes homemade, sometimes takeout, but it’s one of those constants that’s always a winner! I am so grateful for DALS. Last night I made “fish presents” for dinner and I meal planned for the week using DALS cook book. Pizza for dinner is always a big hit at our house! Please don’t do giveaways on DALS. They are one of the insidious things that have ruined blogs. They are demeaning to all involved. They basically demand that we beg for free stuff in public. This is great! We have Pizza and Movie Night every Friday. It has become everyone’s favorite night in the house. We lay out all the ingredients in a train and everyone goes to town! We plan out our menu month by month. Your cookbook recipes are at least 1/3 of the meals. Thank you for sharing and I hope this give away helps families create the necessary time to enjoy cooking and eating meals as a family!! You had me at Pizza. Ooh! I hope I win! Thanks for give away, and thanks for providing dinner inspiration many, many times. We love their stuff! I’ll have to look for the turkey pepperoni! Our family LOVES pizza. Thank you for your blog. This looks soo good. I would love to have a pizza night with the kids. Love apple gate and the book! We love making pizza and adding our favorite toppings. We love DALS! I love making pizza with my boys! I’m due with our first child in less than 3 weeks and I would LOVE to win this so we can enjoy making a pizza together as we figure out how to maintain our “family dinners” once this little lady or gentleman arrives. A friend introduced me to DALS a few months ago, and I’ve become an addict! Love Applegate, love King Arthur. Love DALS, love pizza, love the idea of the kit… thanks for sharing! Ah, pizza. One of the very few things I can cook that can satisfy my carnivore hubby, my picky 8-year old (sausage only, Mom! ), and my veggie-loving self while only using one pan (well, pizza stone, but you know what I mean). Huzzah! A Pizza Making Kit? Yes, please!! Me! Me! Pick me! We love Applegate and King Arthur and Dinner: A Love Story! Oh, and Pizza too! What a sweet giveaway. Would love to win for my family! Oooh what a beautiful kit! We love this brand of food and I just love this blog. My two year old would adore this pizza kit, it would be so fun to make together! This is awesome! Thanks Applegate, and thanks DALS!! oh my!!! between your kids and mine, Applegate has been kept in business 🙂 We love the pepperoni, the chicken nuggets, patties & tenders…the deli meats…the cheeses…YUM! Thank you for the chance!! my sister and I are both on board with the DALS way! would love to try this kit with my two girls- thanks! Who doesn’t like pizza? We used to save pizza crusts for the baby to chew on. This looks fun and yummy! Thanks for the chance to win! Pizza was how my toddler realized he liked tomato sauce, praise be. Pizza! 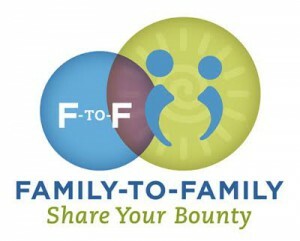 Love it and what a fun way to do it as a family! This is such a sweet idea! My bf was just laid off, and I think a diy pizza night might be just the trick to cheer him up (either with this kit or one of your recipes!). Thanks for hosting this giveaway! I love making homemade pizza. I’d love to try Applegate. Pizza is our favorite family meal. My 11 month old goes crazy when she sees it coming out of the oven. This sounds like a great thing to try! I love your blog! Thanks for the incredible ideas. We eat a lot of Applegate and the quality is really good. This would be so fun with my niece! We love pizza!! Jenny…..I’m your biggest fan!! Pizza is such a favorite in our house – one of the few things my picky eater will eat no questions asked! This is adorable! We love pizza nights here! Friday night= pizza! I’d love to make it a little more interesting! Big fans of pizza and DALS! My husband loves everything pizza related. This would be awesome.